- Silent, safe, bacteria-free moisture. Won't burn or scald. N0 "white dust". - Fully integrated control panel with large, independent power on/off switch with power on light. - Removable outlet cover provides access to a medication cup. This function allows the CLEAR-MIST to be used as a vaporizer. - Mist temperature only slightly above ambient. No risk of burns. - Fully enclosed misting chamber uses a long-life heating element in a constant level waterbath for optimum performance. - 0.6 gallon, lift-out-and-carry tank makes tank easy to remove for filling. - Triple thermostatic protection protects against overheating. - Automatic power shut-off when tanks run dry. - Power cord compartment allows for complete storage of power cord, convenient for travel. - Light weight sturdy construction, portable, personal comfort for home, office or travel. - Operates up to 8 hours on one filling. - Humidifies up to 1,000 sq.ft. (93 sq. m.)*. - Size (LxWxH): 10.05" x 4.0" x 9.63". Weight: 3 lbs. Input Voltage: 120Volts/60Hz. Power consumption: 220 watts. - Warm mist humidification system delivers bacteria-free moisture to provide relief from dry air. - Puts moisture back into the air to help relieve sinus and respiratory discomforts, dry skin problems, scratchy throats and parched sinuses. - Integrated control panel with conveniently located power switch with integral Hi/Low humidity output control, separate power and tank empty indicator lights. - Transparent Lift-Out-And-Carry tank, 2.0 U.S. GAL. (7.5 L) with built-in handle makes filling easy; Large, easy-to-remove tank cap for ease of filling and cleaning. - Patented venturi design misting chamber provides trouble-free and quiet operation. Uses a long-life steel element in a constant level water bath for optimum performance. - Lift-Out-And-Rinse tray collects minerals and eases required care and maintenance. - Washable air filter filters all air coming out of the unit. - Removable outlet grill provides access to a medication cup for use as a vaporizer. - Operates up to 50 hours on one filling. - Humidifies up to 1,150 sq.ft. (107 sq. m.)*. - Size (LxWxH): 14.25" x 8" x 10.5". Weight: 6.8 lbs. Input Voltage: 120Volts/60Hz. Power consumption: 250 watts. - Delivers up to 3.3 gallons of warm, soothing moisture daily. - Digital programmable humidistat maintains a precise, set humidity level throughout the home. - 2 Comfort Control settings. - 2.0 gallon (7.5 litre) capacity. 3.5 gallon (13 litre) per day output. - Kills bacteria with warm mist technology. Warm, sterile moisture. - Large, removable water tank ensures longer run time. - Moisture Cool funnel for cooler warm mist. - Power and refill lights. - Runs for up to 28 hours on one filling. - Best for medium to large rooms up to 750 sq. ft.*. - Size (LxWxH): 15.875" x 11.25" x 14.875". Weight: 5 lbs. Input Voltage: 120Volts/60Hz. - can be used as a vaporizer. - Automatic shut-off when empty. - Operates up to 25 hours on one filling. - Humidifies up to 1,150 sq.ft. (105 sq. m.)*. - Automatic humidistat control: Controls and maintains humidity level automatically. - Removable outlet grill: Provides access to medication cup. This function allows the Clear-Mist to be used as a vaporizer. Mist temperature only slightly above ambient. No risk of burns. - One 2.0 gallon (7.5 litre) capacity tank: Easy to remove for filling. Large, easy-to-remove tank caps for ease of filling and cleaning. - Air filter: Filters all air coming out of the unit. - Triple thermostatic protection: protects against overheating. Automatic power shut-off when tanks run dry. - Misting chamber: Fully enclosed misting chamber uses a long-life Teflon-coated element in a constant level water bath for optimum performance. - Lift-out-and-rinse tray: Collects minerals and eases required care and maintenance. - Size (LxWxH): 14.25" x 8" x 11.5". Weight: 6.8 lbs. Input Voltage: 120Volts/60Hz. Power consumption: 250 watts. - Control panel with 2 speed fan control - ultra quiet operation. - Misting chamber contains high output wick for clean, moist air without white dust. - Wick retains most of the minerals which eases required care and maintenance. - 1.5 gallon capacity. 2 gallon per day output. - Water level indicator with two tone visual display indicates water level at a glance. - Removable top module lifts off completely to allow for safe filling and easy cleaning. - Designed for rooms up to 1150 sq. ft.*. - Size (LxWxH): 10.7" x 11.6" x 9.8". Weight: 6.0 lbs. Input Voltage: 120Volts/60Hz. Power consumption: 20 watts. - Delivers up to 3.0 gallons of cool, soothing moisture daily. - Filter Check, filter change monitor tells consumers when to change their filter. - Runs for up to 24 hours on one filling. - 3 Comfort Control speeds. - 1.4 gallon (5.3 litre) capacity. 3 gallon (11 litre) per day output. - Cool, clean moisture - no white dust. - Removable tank offers easy refilling. 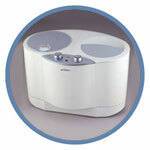 - Humidifies medium rooms up to 700 sq. ft.*. - Soothing cool evaporative moisture system. Moist air without white dust. - Three speed fan control with variable humidity control. - GE electric motor ensures quiet and trouble-free operation. - Controls and maintains the desired humidity level automatically. - Microban antibacterial protection inhibits growth of bacteria and mold. - Large, hidden removable tank with a comfort grip handle. - Removable water tray for trouble-free cleaning. - Separate Power "On" and "Refill" indicator lights. - Filling Capacity - 2.0 Gallons; runs up to 24 hours on one filling. - Daily moisture output - 4.0 Gallons. - Super wide tack opening fits under most faucets. - Lightweight portable unit of contemporary design. - Humidifies medium rooms up to 900 sq. ft.*. - Size (LxWxH): 17.5" x 11.5" x 11.5". Weight: 7.5 lbs. Input Voltage: 120Volts/60Hz. Power consumption: 35 Watts. - Delivers up to 4.0 gallons of cool, soothing moisture daily. - Runs for up to 40 hours on one filling. - 3 Comfort Control speeds and Auto setting. - 2.65 gallon (10 litre) capacity. 4 gallon (15 litre) per day output. - Reads current room humidity. - Extended life filter increases the filter efficiency and life. - Removable tank with comfort carry handle provides easy filling. - Humidifies medium to large rooms up to 900 sq. ft.*. - Relief for dry skin, dry nose and dry throat. Protection for plants and furniture. - Evaporative cool mist system, moist air without white dust. - Humidifies up to 2,900 sq.ft. (269.4 sq.m.)*. - Multi function control panel: Power on and low water indicator lights. Automatic humidistat control, controls and maintains humidity level. Three-speed fan control, ultra quiet operation. - Misting chamber: contains dual high output wicks for clean moist air without white dust. Wicks retain most of the minerals which eases required care and maintenance. - Exclusive condition monitor: Indicates when to clean the air filter or replace the wicks. - Two removable 3 gallon (11 litres) capacity tanks: Lightweight and easy to remove for filling. Large easy to remove tank caps for ease of filling and cleaning. - Size (LxWxH): 23" x 10" x 20". Weight: 22.5 lbs. Input Voltage: 120Volts/60Hz. Power consumption: 150 watts. BIONAIRE - W-7, DIGITAL CONSOLE HUMIDIFIER WITH AIR PURIFIER 8 U.S. GAL. - Natural cool moisture restores balance to indoor dry air! 8 Gallon daily output is enough moisture to humidify up to 1700 square feet. - Digital humidistat for precision humidity control. - Air filter removes 99% of airborne particulate. - Nightlight illuminates display panel. - Operates up to 36 hours per filling. - Power and low water indicator lights. - 8.0 Gallon daily output. - Three removable 3 gallon (11 litres) capacity tanks: Lightweight and easy to remove for filling. Large easy to remove tank caps for ease of filling and cleaning. - Size (LxWxH): 29" x 10" x 21.4". Weight: 25.9 lbs. Input Voltage: 120Volts/60Hz. Power consumption: 150 watts. * Based on ANSI/AHAM HU-1-1987 rating for "tight" construction.